How to debug into my nuget package deployed from TeamCity? I have put a library that my team uses into a nuget package that is deployed from TeamCity into a network folder. I cannot debug into this code though! SymbolSource is one solution I have read about but I would much rather find some way to have access to the .pdb/source files directly from Teamcity. Does anyone know how to do this? Edit. When I check 'Include Symbols and Source' in the Nuget Pack build step TeamCity creates a .Symbol.nupkg in addition to the .nupkg file in the network folder. The .Symbol.nupkg contains the src and the .pdb file. This added the dll, the pdb, and the source files for my library in the nuget package and didn't generate a .Symbols file which I think is only needed for symbol servers. Put the pdb in the NuGet package alongside the dll. Add the source code to the Debug Source Files for the solution that references the package. This means you'll be able to step through code and view exceptions, but you might have to find a file on disk and open it before you can set a breakpoint. Obviously you need to be careful that the source is at the right revision. If you're currently packaging without a Nuspec, you'll need to create a Nuspec, then add the pdb to the list of files in the lib folder "NuGet spec" may be a useful command for generating the initial spec as defined in NuGet docs. Then ensure the Team City Nuget Pack step is referencing your new nuspec. When you have a solution open, right click on Solution, select Properties...Common Properties...Debug Source Files, and add the root source directory for the relevant binary reference. Or see MSDN. Note, you can't open the solution properties while debugging. It's still early days for this method and there are probably a few caveats to its use, see the bottom of this comment and related discussion to learn more. The latest version of dotPeek (free!) can act as a symbol server and generate pdb files on the fly. This has allowed me to debug into the dlls that are served via teamcity. Instructions on how to set it up here. All of this can be done with the free edition of ProGet. This only works if you're using the new .NET Core style .csproj with <PackageReference> (on either .NET Core or .NET Framework). This again assumes you have access to the source code of the NuGet package. Copy the .dll you've just compiled into your local NuGet packages feed folder (On my machine, this is C:\Users\matt\.nuget\packages\), overwriting the existing NuGet package .dll. That's it! You should be able to step into the package while debugging. No messing around with .pdbs or source servers. This has greatly sped up my development cycle. Install Debugging Tools for Windows on the agents. Install & Enable the Symbol Server plugin. Add Symbol Files Indexer build feature to your build configurations. Ensure PDB files are output as an artefact. 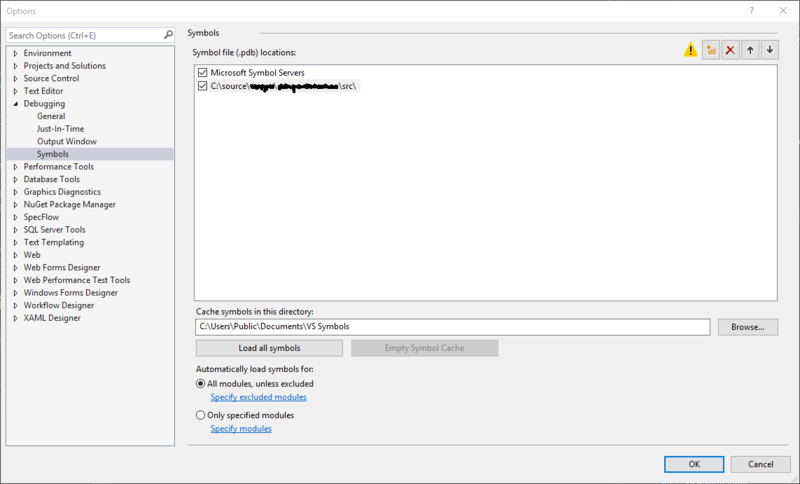 Configure Visual Studio to use TeamCity as source server. If you are using Nuget Package build steps, you can check 'Include Symbols and Source' to output a .symbol.nupkg which contains the PDBs. Depending on whether the Symbol Files Indexer is smart enough to look inside this file or not, you may need to change the file extension for things to work. Note: this doesn't allow you to debug both, only either the nuget package or the solution in which it is installed. In the Nuget package solution, ensure that Tools > Options > Debugging > General > "Require source files to exactly match the original version" is NOT checked. I had to do it this way when I the method I wanted to debug inside the NuGet package was called by the framework and not by my code, thus I couldn't step into it. (In my case, the method was an ASP.NET DelegatingHandler). Once you're done you'll want to undo all your changes via source control so that the NuGet package is referenced correctly. GitLink makes symbol servers obsolete by changing the PDB to point to the Git server. But, as said before, this makes it necessary for the Git repository to be public - until now there's no "proper" way to authenticate when accessing a private repository. Not the answer you're looking for? Browse other questions tagged c# deployment teamcity nuget symbol-server or ask your own question. How to create a nuget package with both release and debug dll's using nuget package explorer? How to place a breakpoint inside a nuget src file and debug? What's the best way to debug a nuget package with its souce code? How do you include Xml Docs for a class library in a NuGet package? How do I create a NuGet package from a project file so it includes the necessary assemblies? How can I debug using a nuget symbols package from a local folder?